Cake-Ya is a small Japanese cake shop located in Port Moody. I went to Cake-Ya at the end of last year with Diana from Foodology and I realized I forgot to review it until I recently came across the pictures (oops). Good thing I have a great memory when it comes to food. We were going to meet up at Cake-Ya one afternoon for desserts, but unfortunately they don’t have any seating inside so we had to take our cake up the road to Starbucks to eat it. We were both expecting it to be like a cafe but it’s really just a store front for a small baking business. They didn’t have any cakes ready but they quickly made us up a strawberry cake roll ($6.50). I was surprised that it was only $6.50 because I was expecting it to be more expensive. The cake was a white spongy cake and it was rolled up with a mound of whipped cream and strawberries. The cake roll was very fluffy and light. I love whipped cream on cakes as opposed to frosting because it adds a light sweetness that doesn’t make you feel sick. 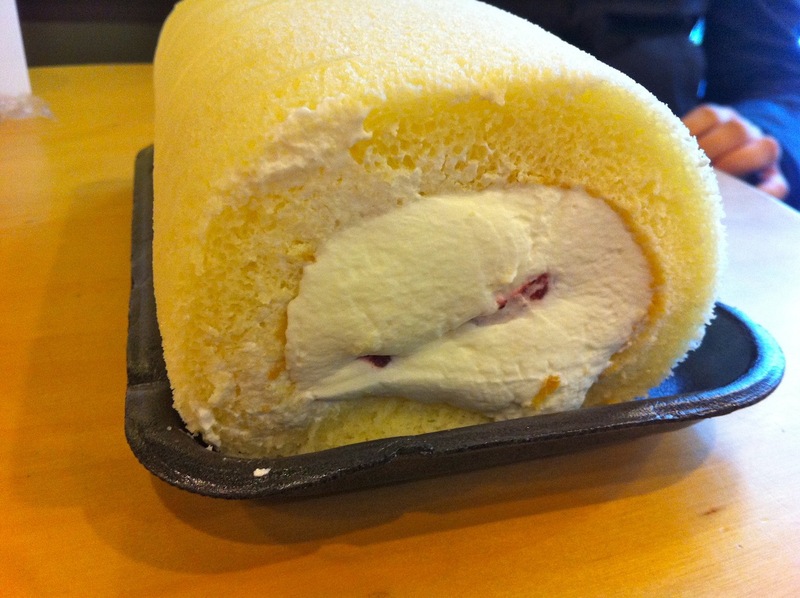 This cake roll reminded me of strawberry shortcake but with a more airy cake. Overall I enjoyed the strawberry cake roll. It was inexpensive and freshly made. They also sell some other baked goods and Japanese custards but I would suggest ordering them in advance since they don’t have tons of stock sitting in the store. Order your desserts in advance and they only accept cash. Yes, for a tasty take home dessert.